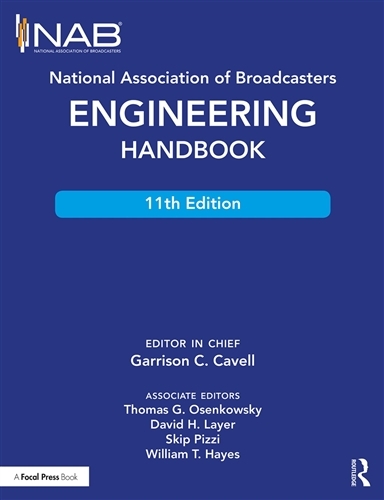 On behalf of the NAB, I am pleased to announce the availability of the 11th edition of the NAB Engineering Handbook. 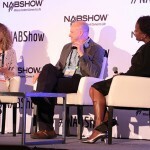 Broadcast consultant Gary Cavell served as editor-in-chief with associate editors Tom Osenkowsky (consultant), David Layer (NAB), Skip Pizzi (NAB), and Bill Hayes (Iowa Public TV). 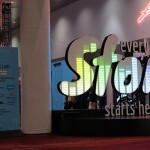 New topics in the 11th edition include Ultra High Definition Television, Internet Radio Interfacing and Streaming, ATSC 3.0, Digital Audio Compression Techniques, Digital Television Audio Loudness Management, and Video Format and Standards Conversion. 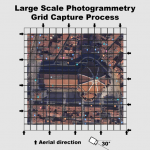 Important updates have been made to incumbent topics such as AM, Shortwave, FM and Television Transmitting Systems, Studio Lighting, Cameras, and Principles of Acoustics. As you can tell from the edition number (11! ), the NAB Engineering Handbook has been around a loooong time. The first edition was published in 1935. Of course at that time, it was all about radio broadcasting. 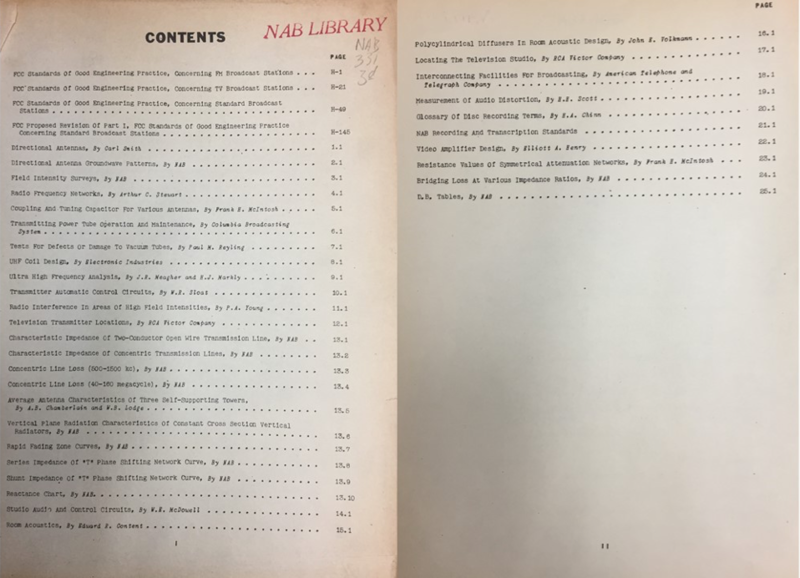 A glance at the Table of Contents from the barely-an-inch-thick 1946 edition (below) gives an indication of just how far broadcasting has come. Updated editions of the original 1935 venerable tome were published in 1938, 1946, 1949, 1960, 1975, 1985, 1992, 1999 and 2007, and the new 2017 edition proudly carries forward the tradition of being the ultimate reference book on broadcast engineering on the planet. 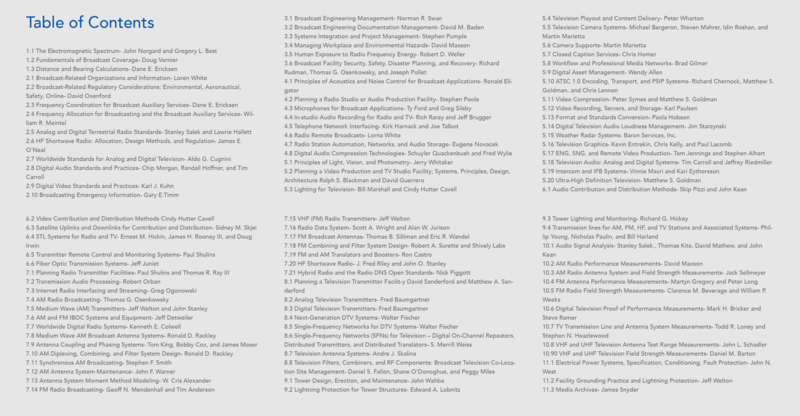 As you can see from the new edition’s Table of Contents (below), broadcasting has expanded its frontiers quite a bit and there is a lot more to understand and talk about now. You can get your copy of this definitive 1948-page handbook now. Both hard cover and e-book versions are available. By Sam Matheny|August 3, 2017|Blog, Radio, Television|Comments Off on Hot off the presses: 11th edition NAB Engineering Handbook now available!